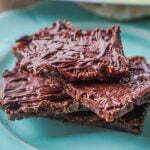 These low carb chocolate toffee bars are simple to make and only require 4 ingredients! Each bar is only 4.3g net carbs! In a food processor, chop the pecans until finely ground. If using a mold, distribute the pecans evenly in each section. If using a baking dish or cookie sheet, use a small one and first line with foil. Then spray the foil before adding the nuts in a thin layer. Next put the butter and Swerve in a small sauce pan. As the butter and sugar melts, whisk until it bubbles and thickens. Pour the syrup over the pecans then place in the oven and bake for about 12 - 13 minutes. Take them out and let them cool before placing into the freezer for 1 hour. This will solidify the bars completely. After an hour take them out and make the chocolate. Place the chips into a microwaveable bowl and cook for 30 - 60 seconds. Mix well so it's melted and smooth. Spread over the bars. Wait for about an hour or so until the chocolate dries. Store in the refrigerator.